The range of crinoid fossils on the market today is huge. The following is a brief inventory of the range of specimens with approximate market values. As always when looking at fossils quality and rarity are the prime factors When it comes to price. It takes a lot of experience to judge how rare a particular piece is. Quality is a little easier to judge. More clarity and detail=better quality. These pictures illustrate the comments below. Click on a picture for a larger view. Please be patient, bigger pictures mean bigger file size and longer loading time. A nice crown is harder to find and because of the work involved in cleaning and preparation they are considerably more money. These can run between $25 and $100 or more depending on the rarity of the species, the detail of the fossil, and the amount of preparation work involved. They can be impressive. 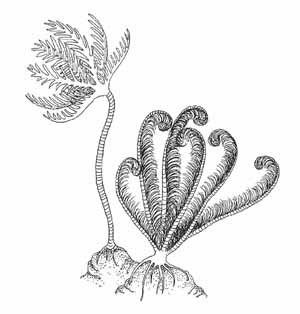 Crinoid fossil stem fragments are very common and inexpensive. A large well defined piece might be found for under $5. Smaller fragments may cost $1 or less. These smaller fragments are often included in ready made fossil collections. This article was written in 2005. The information generally still applies, but prices have gone up.